To honor and celebrate 4 iconic footwear models FROM NIKE (Air Force 1, Airmax, THE Cortez and the dunk.) we released a commemorative collection. each of these iconic pieces of nike footwear were interpreted into fully knit socks that captured the essence of the shoe and what it represented. Special packaging was created for each style as well as collector cards that told the story of the shoe. I was responsible for the design of each sock and box artwork. TEAM. WHILE I DESIGNED THE SOCKS AND THE BOXES, WE HAD A PRODUCTION TEAM THAT CURATED THE STORY INSERTS AND coordinated PRODUCTION OF THE PRINTED BOXES. THIS, LIKE SO MANY PROJECTS, WAS TRULY A TEAM EFFORT. SPECIAL CALLOUT TO GEORGE NEEDHAM AND AUDREY DESLER OUR PRODUCTION TEAM, CARRIE GIESBERS OUR PRODUCT MANAGER AND CAROLYN NORRIS, EDWIN GONZALEZ AND JULIAN GREEN OUR DEVELOPMENT TEAM. Kalle Crafton was our copyrighter for each story card insert. 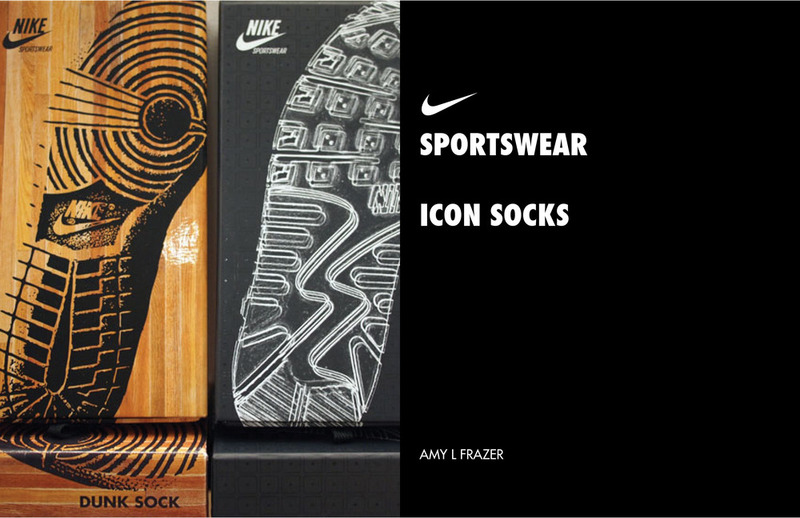 OVER THE YEARS I'VE WORKED ON QUITE A FEW LIFESTYLE SOCKS FOR NIKE SPORTSWEAR. GRAPHICS AND COLOR HOOKS TO APPAREL AND FOOTWEAR BRINGING ENERGY TO THE EVERYDAY COMFORT OF THESE NIKE SOCKS. BELOW IS A SAMPLING OF JUST A FEW!